Region: This borer is found east of the Rocky Mountains, in the United States and southern Canada. Life cycle: This insect produces one to two generations each year. There are two generations in the south and usually but one in the northern states. Hibernation is done by the larva or pupa in a cocoon, one inch beneath the soil, where it will remain until spring. Physical Description: The 1 inch long, wrinkled Caterpillar is white with a brown head. The adult moth is orange, black with transparent wings, and coppery fore wings and black stripes around its abdomen. It is usually 1 to 11/2 inches in length. The flat, oval eggs are brown and are laid singly in the soil. Feeding characteristics: This pest attacks cucumber, gourd, melon, pumpkin and squash plants by entering the base of stems in early summer, causing the vines to wilt. Masses of yellow or greenish frass can be seen coming out of the holes in the stems. Controls: Watch for a sudden wilt of the plant parts, as you can control the borer by making a slit in the infested stem and removing the borer. Heap soil over the damaged stalk to encourage rooting. 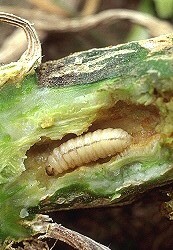 A delayed planting of summer squash may miss the feeding larvae. You can accomplish the same by planting early, as the borer doesn't lay its eggs until July, by this time the plant is large enough to withstand an attack. Clean up and dispose of vines after harvest.